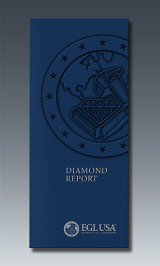 The EGL USA Diamond Report is a comprehensive overview of the world’s most timeless stone. Identification and evaluation elements include the classic criteria of carat weight, clarity grade, color grade, cut (shape and style), finish, fluorescence, plotting, and proportions. Diamond Reports are offered in a variety of styles, and are also available for diamond jewelry. A full-size Diamond Report issued for a loose stone includes an exclusive EGL USA bonus: a free appraisal summary from the lab’s affiliate, Universal Gemological Services (UGS).